The Arigato Event in Omura City was the first of 2015 and also the first Arigato Event for me personally. Given the build up we had had all along our stay in Omura, it was expected to be a stressful but (hopefully) rewarding night. We had rehearsed our program and written our thank you letters, but some of us weren’t too confident of themselves by the time we prepared for the main event. Every day in Omura had been very interesting but also very busy, and more time for practicing might have been more than welcome in some of our opinions. But, our schedule can’t cater to everyone’s personal preferences and therefore we had to make do with what we had. The final rehearsal managed to lift our spirit, although a certain someone (self insert \o/) still felt rather desperate with his part in a song we were to perform shortly. Despite the author’s pessimism the event itself was a huge success. After the formal speeches by the city representative, World Campus International CEO Hiro Nishimura and the representative of the Local Organizing Committee we got to enjoy a delicious buffet with our host families and socialize with each other. There was also dancing to the rhythm of a local brass orchestra, an activity that remained hugely popular and excessively entertaining (for both the participants and those following from the sidelines) all throughout the night. Then came the turn for our Arigato Event, which consisted of several parts. 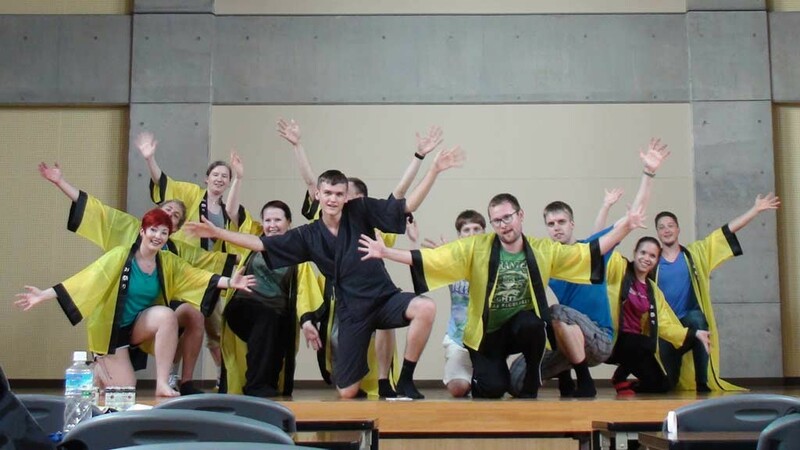 Firstly we thanked the LOC, which was followed by the Japanese Medley – a dance choreography containing several popular Japanese songs and their dance choreographies as performed (or at least attempted) by the World Campus Japan participants. Following the medley we sang the song Tomorrow – from the American musical Annie – arranged so that each country represented in the program got a part in their native language. And thank goodness it went all right. After the song we proceeded to read our thank you letters aloud and present thank you cards to our host families, with whom we stayed to watch a slide show of our stay in Omura (thank you Nicole!). The Arigato Event proper was followed by a performance from our very own comedian duo Espen and Jurrien, the two funniest men in both Norway and the Netherlands. Their interpretation of the popular Japanese sketch “rassun gorerai” was enough to have the audience wipe tears from their eyes while laughing. After our short minute in the spotlight was finally over, the brass orchestra took over again and we took over the dance floor with a wide array of samba, conga, trepak and many other dance styles twisted beyond recognition in our amateur hands (or feet?). The point is, we had the fun of our life with our host families, the local people and even the local staff. When the night was finally over we were exhausted, ready to fall asleep on command and as happy as a human being could ever be. What a way to end our stay in Omura City.